A university student has been inspired by her brothers to swim across the English Channel to raise money for the RNLI. Jennifer Laffan is taking on the challenge after volunteering with the charity as a lifeguard at Coldingham Bay during her summer holidays. The 22-year-old’s love for swimming began at a young age as her mum, Harriet, worked at her local leisure centre. And Miss Laffan has been inspired to make the most of her life by the way her brothers James, who is autistic, and David, who is severely disabled, tackle everyday problems. She vowed to take on the challenging swim when she was in her first year at school and took on a 10km outdoor swim for her 18th birthday. 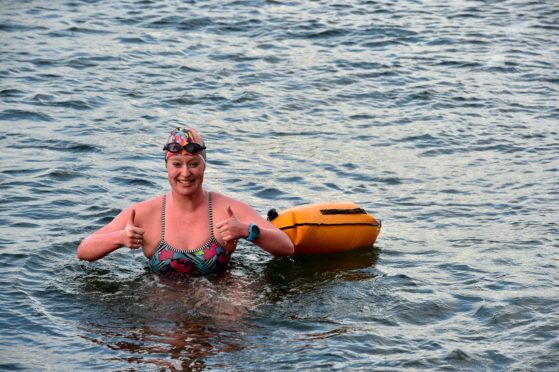 She said: “I was warned at that swim that I’d catch ‘the bug’ and would book a Channel slot sooner or later – and it was true. Miss Laffan left Linlithgow in West Lothian in 2016 to study a six year architecture course at Robert Gordon’s University. She joined Swim Free Aberdeen and has been training in freezing temperatures. She recently completed a 1.1 mile swim from Macduff Marine Aquarium to Tarlair Pool while it was snowing. Miss Laffan, of Aberdeen, chose to raise money for the RNLI after she learned of the important rescue work they do in the community. She said: “There’s something very special about having so many people volunteering to give up their time and put their lives at risk to save lives. “They’re a great bunch of people who are selfless – I chose to fundraise for them as well as take on the challenge. “It costs about £3,000 for the boat supporting the swim. I paid half of this myself with the other half coming from Fayze Limited sponsorship. Because of this, all the donations pledged will go straight to the RNLI. “My dad Seamus and all of my family are really supportive – my brother David always tells me ‘good swim’ and I know that if James understood he would be proud. “I’m nervous, especially now it’s 2019 and it’s getting closer but I’m swimming over 20km between Monday to Friday and doing six or seven kilometre outdoor swims through the weekends. Miss Laffan is booked in to swim the Channel between October 1 and 5.